UM Project’s Cork U.M.O. is a Coffee Table, Bench and Side Table All in One! Is it a side table? Is it a chair? Is it a desk? Is it a bench? The multifunctional (and adorable) U.M.O. (Unidentified Magical Object) from UM Project can be all three! At last weekend’s BKLYN Designs, the versatile piece impressed Inhabitat editors with its versatility so much that it received the Inhabitat Editor’s Choice Award for Most Engaging Design. Made almost entirely from sustainably harvested cork, the playful form will charm your kids just as much as it appeals to you. The U.M.O. will spark your imagination in a way that most furniture doesn’t even attempt. Will you rotate it on its side and use it as a bench, or make it the centerpiece of the room, stuffing magazines and books in its circular and rectangular slots? In a child’s room, its placement and function could change daily — and the aluminum inserts can house everything from art supplies to plush toys. Brooklyn-based design studio UM Project, which stands for Users & Makers, is a veteran of BKLYN Designs and consistently delivers playful furniture creations the whole family can enjoy – like their white-board paint coated table, which also had Inhabitat’s editors swooning at this year’s show. UM Project's Cork U.M.O. is a Coffee Table, Bench and Side Table All in One! Is it a side table? Is it a chair? Is it a desk? Is it a bench? The multifunctional (and adorable) U.M.O. (Unidentified Magical Object) from UM Project can be all three! 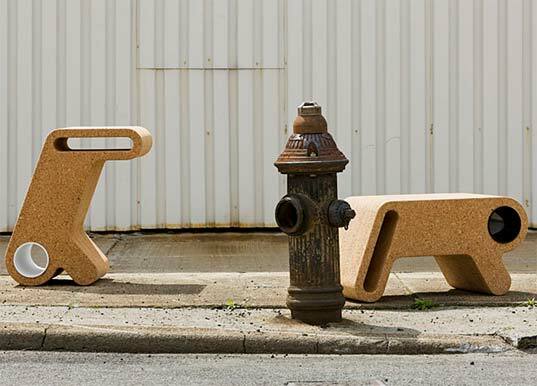 At last weekend's BKLYN Designs, the versatile piece impressed Inhabitat editors with its versatility so much that it received the Inhabitat Editor's Choice Award for Most Engaging Design. 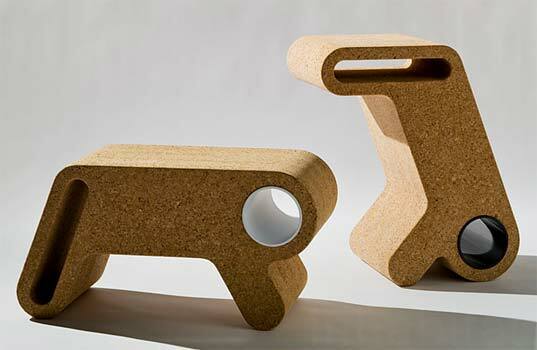 Made almost entirely from sustainably harvested cork, the playful form will charm your kids just as much as it appeals to you.